CONSTANT was contracted in 2018 to create a unique, customized 8-hour training for new City Emergency Managers in the Los Angeles County Operational Area. This training was developed at the behest of the Disaster Management Area Coordinators of Areas C, D, and E in Los Angeles County. The training outlines key roles and responsibilities in the phases of response, recovery, preparedness, and mitigation. The training materials developed include a “Toolbox” resource compilation to help new city emergency managers identify key resources and training goals for their first year. The course content covers topics such as grant funding, local requirements and regulations, resource request processes, communication systems, and existing partner networks. In addition to creating the course content, CONSTANT also conducted a pilot delivery of the course with new and existing city emergency managers from throughout the County, to collect feedback and improve the course overall before implementation. 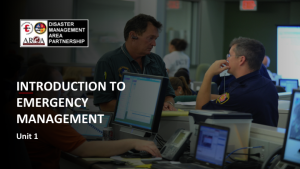 The course will continue to be made available through the DMACs and will continue to assist new city emergency managers in Los Angeles County as they navigate the complex world of emergency management.